Rocket Mortgage FieldHouse is now closed for the summer. The Shania Twain concert on Saturday night was the last event at the venue until this fall as work continues on Rocket Mortgage FieldHouse Transformation, the renovation project to update and modernize the almost 24-year-old arena. The initial phase of construction began on the exterior of the arena last February, and now that the Cavaliers NBA season has concluded, crews will also begin on interior areas of the facility as well. Rocket Mortgage FieldHouse will re-open in the fall for the 2018-19 Cavaliers and Cleveland Monsters seasons along with a regular event schedule, beginning with the Justin Timberlake concert on October 2nd. The first and more noticeable sign of the 2018 summer construction schedule will be the preparation for the demolition of the North Bridge that connects the JACK Casino parking garage to Rocket Mortgage FieldHouse. The bridge will permanently come down next week. Starting Monday, June 25th, all lanes on Huron Rd. will close completely for one week from Ontario St. to E. 6th St. This stretch of Huron was already reduced to two lanes (one eastbound and one westbound) back in February when the initial phase of demolition and construction began on the arena. The two lanes will re-open no later than July 2nd. Detour signs will be posted for motorists needing to travel that span of Huron Rd. The Cleveland Indians have no home games scheduled at Progressive Field during this period. Construction also continues on the south side of the facility. Lanes on North Roadway (the street closest to the arena) will have limited access to motorists traveling through Gateway Plaza. While areas around the arena will be zoned off, work on Rocket Mortgage FieldHouse Transformation will not impact fans attending Cleveland Indians home games at Progressive Field. 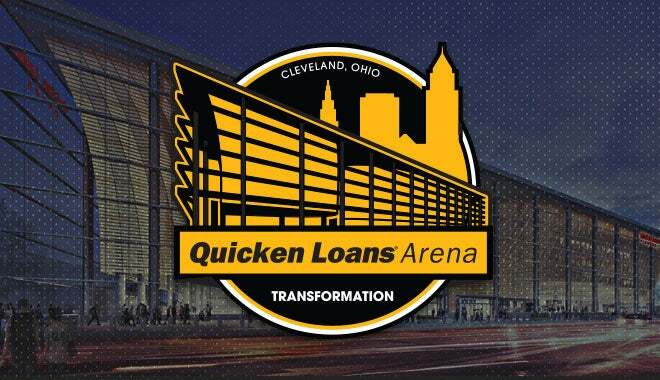 QUICKEN LOANS ARENA BOX OFFICE CLOSED: Due to The Q’s temporary closing, the Rocket Mortgage FieldHouse box office will be closed for the summer, re-opening in the fall. During this time, tickets for any announced future event scheduled at Rocket Mortgage FieldHouse will be available for purchase at TheQarena.com or at any of the 58 Discount Drug Mart northern Ohio locations. CAVALIERS TEAM SHOP WILL REMAIN OPEN: The Cavaliers Team Shop located inside Rocket Mortgage FieldHouse will remain OPEN during regular business hours. The public will be able to enter the Team Shop at its E. 6th St. entrance or shop online at cavs.com/shop. For Team Shop hours visit cavs.com/shop or follow @CavsTeamShop on Twitter and Instagram. RTA WALKWAY OPEN: The RTA covered walkway from Tower City Center to Rocket Mortgage FieldHouse will remain open for Cleveland Indians games. Fans can enter and exit the walkway at Ontario St. outside of The Q. NEW! THE Q TRANSFORMATION WEBCAM: Two EarthCam cameras have been installed outside of Rocket Mortgage FieldHouse to provide 24/7 live streaming video coverage on the progress of Rocket Mortgage FieldHouse Transformation project. One camera will provide a panoramic view of the construction taking place, with a second camera that offers a close-up view of both ends of the arena. To access the live stream go to TheQTransformation.com. TheQTranformation.com is now updated with new renderings and information about the transformation project with FAQ’s about the closing of Rocket Mortgage FieldHouse for the summer of 2018. When Rocket Mortgage FieldHouse re-opens its doors in October, fans will be asked to “pardon our dust” as both interior and exterior work continues on the building during the Cavaliers 2018-19 season. Rocket Mortgage FieldHouse will close once again for all event activity during the summer of 2019. In September 2019, with the Transformation complete, the newly renovated Rocket Mortgage FieldHouse will re-open for year-round event activity with the start of the Monsters and Cavaliers 2019-20 seasons. EarthCam is the global leader in webcam technology and software. They provide live streaming video and megapixel cameras, and managed services for consumers and businesses in more than 1,500 cities throughout all 50 states and 46 countries as well as 80 of the top 100 construction companies. Their expertise includes developing technology to manage camera networks and delivering millions of images daily to over 290 countries. EarthCam has the expertise and knowledge to offer consumers the ability to view, create and share webcam content at any time and in any location in the world. They were founded in 1996 in Hackensack, NJ and have 150 employees.